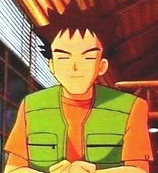 Brock was formally the gym leader of Pewter City. He plans to become the best pokemon breeder. He is good natured and wise with his age. Strange, how old could he be. I guess that's just compared to Ash who is a little younger. He is however girl crazy. Every time he sees a Nurse Joy or Officer Jenny he thinks he's fallen in love. All around he is a pretty good guy and treats pokemon with respect. His pokemon include: Geodude, Onix, Zubat, and a Vulpix.